It seems the culinary rage for ebelskiver goes on and on. 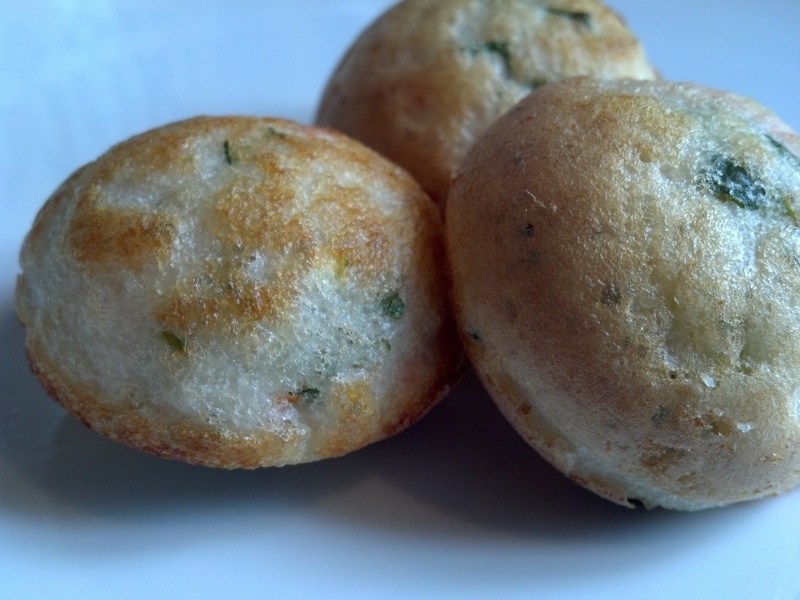 There’s an Indian version–called variously kuzhi appam, kuzhi paniyaram or karandi appam–which can be sweet or savory. 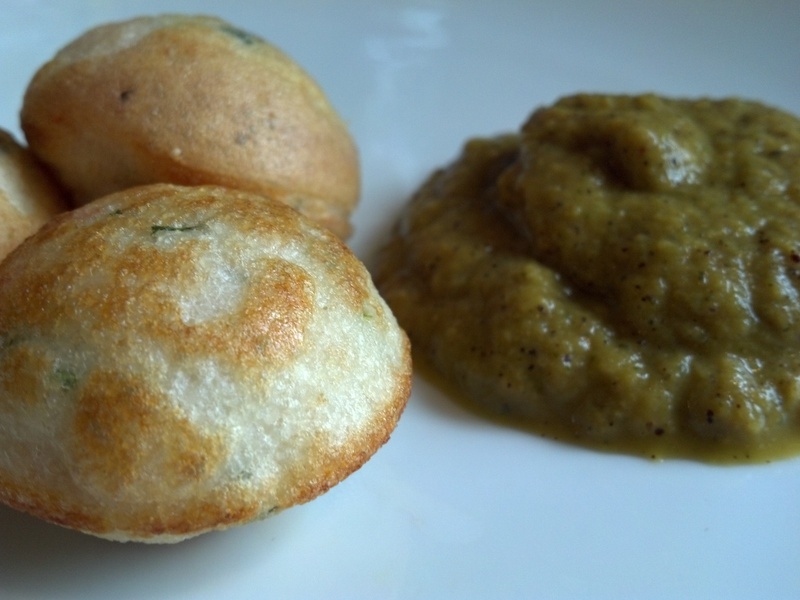 For the most part, making appam is one of the best methods for getting rid of leftover idli or dosa batter and those last little bits of vegetables hanging around in the kitchen. This version is savory, and works as breakfast, lunch, tiffin or dinner. You can switch out the veggies with pretty much anything. Just make sure you cook veggies that have a high water content (leafy greens, bell peppers, eggplant, etc) in order to dry them out before adding them to the batter. Otherwise, you will have some rather damp and unappetizing appam on your hands. Note: If you are not inclined to make idli or dosa batter, some Indian grocery stores stock idli and/or dosa batter in their refrigerated sections. Otherwise, beg some from your Indian friends. 1. If your batter is cold, allow it to come to room temperature. 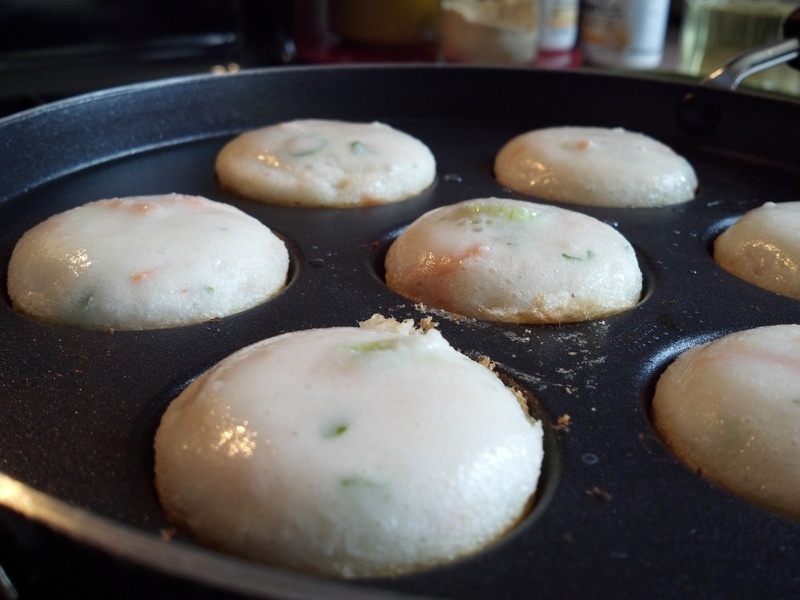 Place the appam pan on the stove to heat over a medium flame. 2. 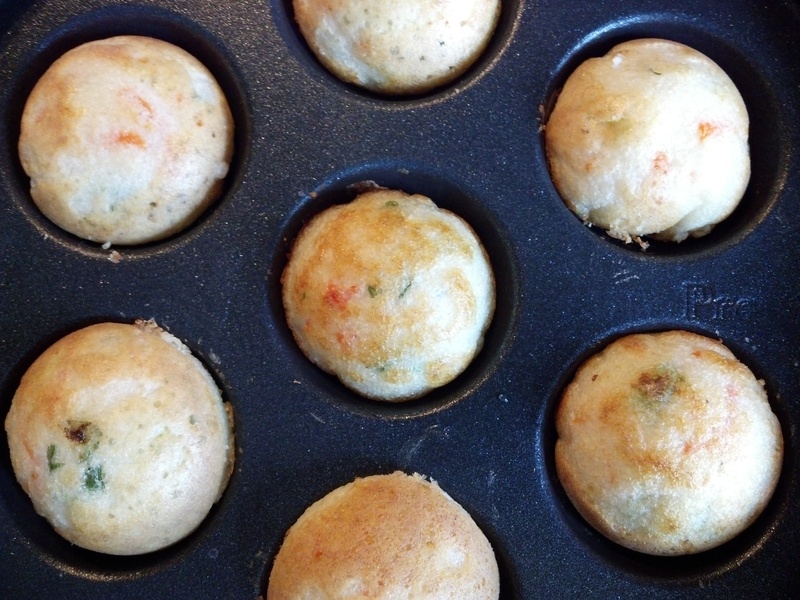 While the pan is heating, mix the veggies into the batter. Add a little salt if necessary. 3. When the pan is hot, add a drop of oil to each well. If you have a non-stick coated pan, you will not need to add oil except for the first round. Pour batter into each well until almost full. Do not fill completely or you will get overflow as the appam cook. 4. When the edges of the appam start looking dry (kind of like when you are cooking pancakes on a griddle), use the flipping tool to push gently at one side of the appam until it flips over within the well. Continue cooking for about 1 to 2 minutes, until the appam are cooked through. Flip out onto a plate/bowl/serving dish and begin the next round, continuing until the batter is used up. 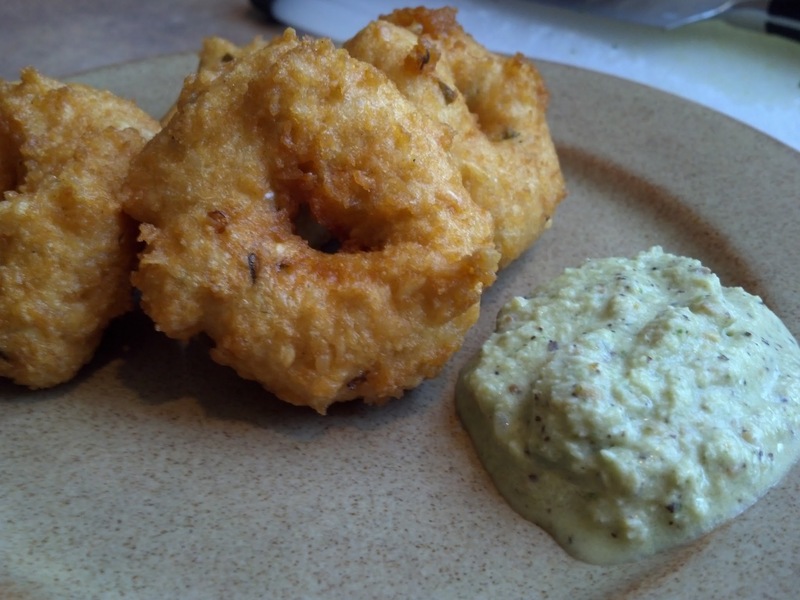 Serve with sambar and/or chutney. Can be refrigerated in a tightly sealed container for a few days. Warm in a foil-covered pan in a 250F to 350F oven (depending on how quickly you want them heated) to maintain texture. You could heat them in a microwave, but I can’t guarantee you’ll enjoy eating them if you do so.